Representations and descriptions of emblems signifying an officers name, unit, years of service and other paraphernalia. Description: The Chicago Police Department utilized the above medallion on the Department’s horses in the 1890’s and the early 1900’s. The piece was used as ornamentation on a horses bridal. It is unknown when this piece was taken out of service, but is no longer in use today. Description: Rectangular, gold-colored metal nameplate with radius edges bearing the member’s correct last name. The nameplate will be worn in conjunction with the unit designator and will be worn in the eyelets which are centered above the right-hand shirt pocket. Material: Hot nickel plating over a base metal with a heavy gold plating over the hot nickel finish. The gold plating will match the Chicago Police Department insignia and a heavy coat of clear flat backing enamel will be placed over the gold plating. Dimensions: The nameplate will have an overall length of approximately 2 1/4 inches by 1/2 inch wide with a thickness of approximately .062 inch. Each end will have a 1/8 inch radius. All corners and edges will have a 1/64 inch radius. Lettering: Individual last names will be “Pantograph” engraved in Gothic block, medium style, .250 inch in height, .012 inch deep, and .017 inch to .020 inch line width. The lettering will be filled with air dry flat black lacquer prior to an application of a clear flat baking enamel which will be applied to the face of the entire plate. Finish: Satin Gold. All edges will be polished smooth and blemish-free. The face surface will be grease buffed to a smooth finish. The back surface plate will be smooth and removed of all sharp edges. Attaching Device: A clutch stud will be attached to base of the nameplate by the swagging method to ensure hardness of the base and strength of the stud. The stud length may vary from a minimum of 5/16 inch to a maximum of ½ inch with three position grooves. Clutch studs will be centered on the reverse side of plate 1 5/8 inches apart. Nameplate may also attach via pin. Description: Rectangular, black or navy-colored cloth nameplate and unit designator with radius edges bearing the member’s last name and unit of assignment. The nameplate and unit designator combination is to be worn on the right breast as an alternative to wearing the metal nameplate with unit designator. The nameplate will be sewn onto the garment and the unit designator will be affixed with velcro. Dimensions: The nameplate will have an overall length of approximately 1 inch high by 3 1/3 inches wide. Each end will have a 1/8 inch radus. All corners and edges will have a 1/64 inch radius. Lettering: Individual last names will be embroidered in a block font and be 3/8 inch in height. The unit assignment designator will have two lines of type. For districts, the district number and the word “DISTRICT” will be printed on the top line and the district name will be printed on the bottom line. Member’s last name, unit number, and unit name will be centered horizontally. Description: Rectangular, gold-colored metal nameplate and unit designator with radius edges bearing the member’s last name and unit of assignment. The nameplate with unit designator will be worn in the eyelets which are centered above the right hand shirt pocket. Dimensions: The nameplate will have an overall length of approximately 2 1/4 inches wide by 1 inch high with a thickness of approximately .062 inch. Each end will have a 1/8 inch radus. All corners and edges will have a 1/64 inch radius. Lettering: Individual last names will be “Pantograph” engraved in Gothic block, medium style, .250 inch in height, .012 inch deep, and .017 inch to .020 inch line width. The lettering will be filled with air dry flat black lacquer prior to an application of a clear flat baking enamel which will be applied to the face of the entire plate. A line will bisect the nameplate beneath the member’s name. Beneath the line will be the member’s unit of assignment. The unit assignment designator will have two lines of type. For districts, the district number and the word “DISTRICT” will be printed on the top line and the district name will be printed on the bottom line. Member’s last name, unit number, and unit name will be centered horizontally. Finish: Satin Gold. All edges will be polished smooth and blemish free. The face surface will be grease buffed to a smooth finish. The back surface plate will be smooth and removed of all sharp edges. The entire nameplate will have a satin finish. Attaching Device: A clutch stud will be attached to base of the nameplate by the swagging method to ensure hardness of the base and strength of the stud. The stud length may vary from a minimum of 5/16 inch to a maximum of 1/2 inch with three position grooves. Clutch studs will be centered on the reverse side of plate 1 5/8 inches apart. Nameplate may also attach via pin. Description: Worn by Chicago Police Department uniformed Members of all ranks, including uniformed civilian members. Each bar signifies 5 years of service and measures approximately 5/8″ in height and 2″ in width. The star signifies 20 years of service and measures approximately 5/8″ in diameter. 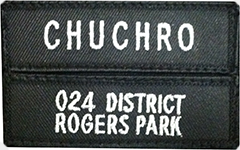 The patch or combination of patches are worn on the wearer’s left lower sleeve. Description: Rectangular, gold-colored nameplate with radius edges bearing the member’s unit of assignment. The unit designator will be worn in conjunction with the nameplate and both will be worn in the eyelets which are centered above the right-hand shirt pocket. (background) metallic gold substrate and black printed copy. Dimensions: The thermoplastic material will be laminated to a thickness of .045 inch with an overall dimension of 2 1/4 inches wide by 1 inch high. All edges are to be square and smoothly cut. Corners may be rounded but will not exceed a radius of 1/8 inch. There will be no burs or sharp edges on the finished product. The designator will have two 5/64 inch diameter holes drilled 1 5/8 inches apart positioned approximately 3/16 inch from the designator’s top edge. All measurements are center to center. Individual letter height will be approximately 5/32 inch and spaced approximately 1/16 inch apart. Lettering: Black copy will be printed on the front only in a suitable, Sansserif Gothic Block type face which closely resembles the engraving on the metal nameplate to which the designator will be affixed. The unit assignment designator will have two lines of type. For districts, the district number and the word “DISTRICT” will be printed on the top line and the district name will be printed on the bottom line. There will be approximately a 3/32 inch space between the lines of type. The copy will be printed on a gold background. Gold color and metallic gold substrate will be Plastic Graphic Company #304, or approved equal. The printing will be over-laminated with a clear transparent film to minimize wear. Adhesive lamination is not acceptable. All printing must be clear, sharp, properly centered, and uniform in style to fit properly on the designator’s front exposed field of view. Finish: Satin Gold. All edges will be polished smooth and blemish-free. The face surface will be grease buffed to a smooth finish. The back surface plate will be smooth and removed of all sharp edges. The entire nameplate will have a satin finish.